Riley James provides a number of domestic and non-domestic energy surveying services for a variety of purposes. Our Surveyors are some of the most experienced in the marketplace having been qualified since the first introduction of EPC’s back in 2007. We have prepared thousands of EPC’s for an extensive range of property types ranging from bulk social housing stock to private individual dwellings. Our Surveyors are fully qualified and accredited Domestic Energy Assessors (DEA’s). For an individual quotation or to discuss bulk EPC requirements please contact us. We are able to provide Green Deal Assessments (that incorporate an EPC) through our network of fully qualified and accredited Green Deal Advisors. For an individual Green Deal assessment quotation or to discuss bulk assessment requirements please contact us. 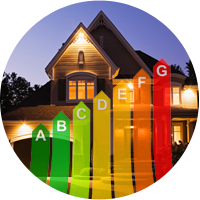 We are able to provide Non-Domestic Energy Assessments on commercial buildings up to level 4 classification. For an NDEA quotation please contact us.